When it comes to leash training a puppy, there are several different ways to train your puppy to walk calmly on a leash. All of them work well so your choice will really depend on which method appeals to you. If one method isn't working for your puppy you can try a different method. These dog leash training methods will also work for leash training a dog who is older than a puppy. 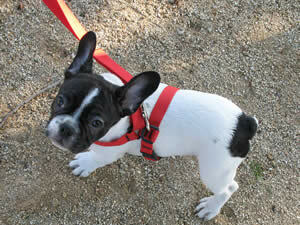 Before you start leash training a puppy you'll need to get your puppy a collar and leash. For young puppies, the best choice is a plain buckle collar and a leash to match. A nylon collar is usually a good choice. You probably don't want to spend a lot of money on a collar for a young puppy since he will quickly outgrow it. To check the collar for proper fit, be sure you can slip two fingers between your puppy's neck and their collar. Choose a leash that is about six feet long. You can start leash training a puppy by placing the collar on your puppy and allowing him to get used to it. It usually takes a puppy a little time to get used to wearing a collar since it's a strange sensation to have something around his neck. He may paw at it or try to pull it over his head. If the collar is on properly and it's not too tight or too loose, your puppy shouldn't be able to remove it. He will get used to it shortly. However, don't try to attach the leash or do any walking with your puppy on the same day you introduce the collar. It's a good idea to introduce the collar while your puppy is indoors so you can keep an eye on him. You don't want your puppy to accidentally get the collar caught on anything while he's trying to get rid of it or pull it off. After your puppy is familiar with the collar you can attach the leash to it. Again, it's a good idea to do this while your puppy is indoors and you are nearby. This way you can watch your puppy and supervise. Once the leash is attached to the collar you can let your puppy go to walk freely. Let him get used to feeling the leash giving a slight pull to the collar as he drags it around. Watch and see that he doesn't get the leash caught on anything such as a piece of furniture. You can let your puppy drag the leash around for a little while before removing it. Once you've laid this ground work you're ready to attach the leash and start walking with your puppy. You can do the actual leash training inside the house or in an enclosed yard, but do work in an area that is safe for your puppy. This way, if he gets away from you he won't run loose or get into traffic. Option 1: With the leash attached to your puppy's collar you can attach the other end to your belt or waist. Walk normally and encourage your puppy to keep up with you. Praise your puppy and reward him for walking with you. Your puppy may run here and there at first, but he will start walking near you to get the treats. It doesn't matter which side your puppy walks on with this method. Option 2: With the leash attached to your puppy's collar you can carry the other end of the leash in your hand. Encourage your puppy to walk on your left side at knee level. You can make your left side very appealing to your puppy by carrying a big wooden spoon loaded with peanut butter. NOTE: The Option 2 method will also work with a clicker if you're interested in clicker training. Learn more about clicker dog training. Option 3: With the leash attached to your puppy's collar you can carry the other end of the leash in your hand. You can do things the old-fashioned, traditional dog training way. Simply walk with your puppy next to you and when he lags behind or gets ahead of you say, "Heel," and move him back into position. If you repeat this enough times your puppy will eventually learn it, but it's not the most fun way of learning for most puppies. All of these methods will work for leash training a puppy. Puppies are like little sponges and they can learn very fast. If you repeat these lessons every day for a little while your puppy should be walking calmly next to you in just a few days. Do remember to offer lots of praise and treats to your puppy. They learn best with positive reinforcement. You can reinforce what you teach your puppy by practicing on walks with him. If your puppy pulls on the leash or doesn't pay attention to you, you can get his attention back by coming to a complete stop. Turn yourself into a statue. Once your puppy realizes there is no movement he will run back to you to see what's happening. Then you can resume your walk. If you do this each time your puppy leaves your side, your puppy will start staying closer. You can also walk in a zig zag pattern, changing directions frequently to keep your puppy guessing which way you're going. If you do this, your puppy will have to pay attention to you and walk more closely at your side. Leash training a puppy is a very good idea. Puppies learn very fast and it can be easier to teach them many things when they're young, before they develop bad habits like pulling on the leash. Leash training a dog can be done, of course, but it's even better to teach your puppy how to behave on the leash and avoid any later problems.